The Algerian Army is now operating MaxxPro Dash armoured vehicles, with at least three seen in service with the country’s Special Forces. The MaxxPro Dash is a smaller and lighter version of the MaxxPro family, which manufacturer Navistar Defense says is more mobile. It has a smaller turning radius and higher torque-to-weight ratio. Made less likely to roll over, it was optimised for operations in Afghanistan. 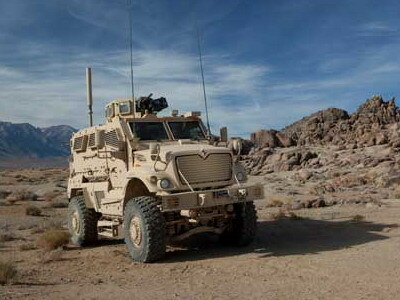 The MaxxPro Dash mine-resistant, ambush-protected (MRAP) vehicle is built to withstand ballistic arms fire, mine blasts, improvised explosive devices (IEDs), and other emerging threats. Its V-shaped hull helps deflect blasts out and away from the crew and its armouring can be customized to meet different mission requirements. The vehicle is 6.2 metres long and 2.6 metres wide. It weighs 15 500 kg with a payload of 4 500 kg. Power is provided by a DT-M10 six cylinder diesel engine developing 425 hp and giving a speed of 105 km/h. An armoured turret can be fitted to the roof and equipped with a 7.62 or 12.7 mm machinegun. Algeria’s vehicles are fitted with the turret but do not appear to have a weapon mounted. Algeria continues to add new equipment to its military, which in the last month has included two new Kilo class submarines from Russia. Also in the last month, it has emerged that Algeria is operating unmanned aerial vehicles designed in the United Arab Emirates, and Norinco SM4 120 mm self-propelled mortar systems from China.